Probably my favorite trip ever in Korea (although our honeymoon in Jeju was also a blast) was the weekend trip Sunnie and I took to Gyeongju. 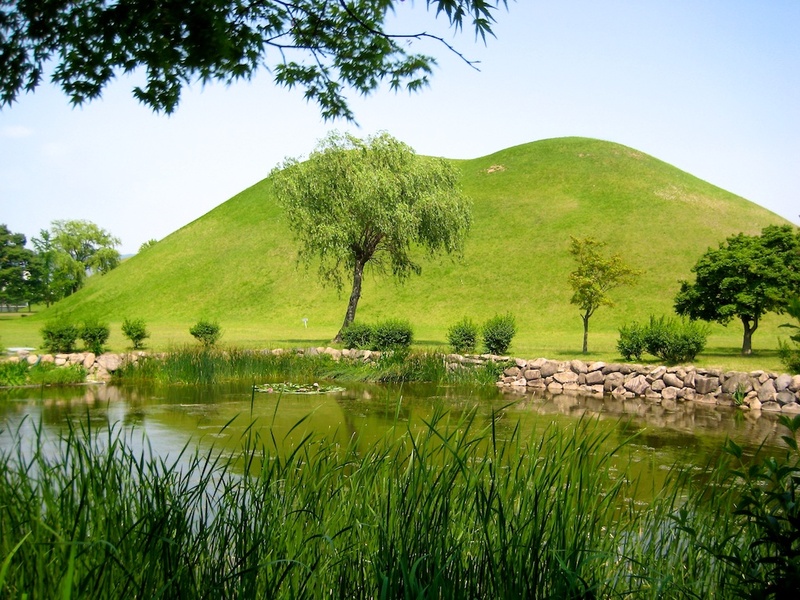 3-4 hours from Seoul by bus, Gyeongju offers beautiful scenes of nature and glimpses of Korea’s history, as it was the capital of the kingdom of Shilla. 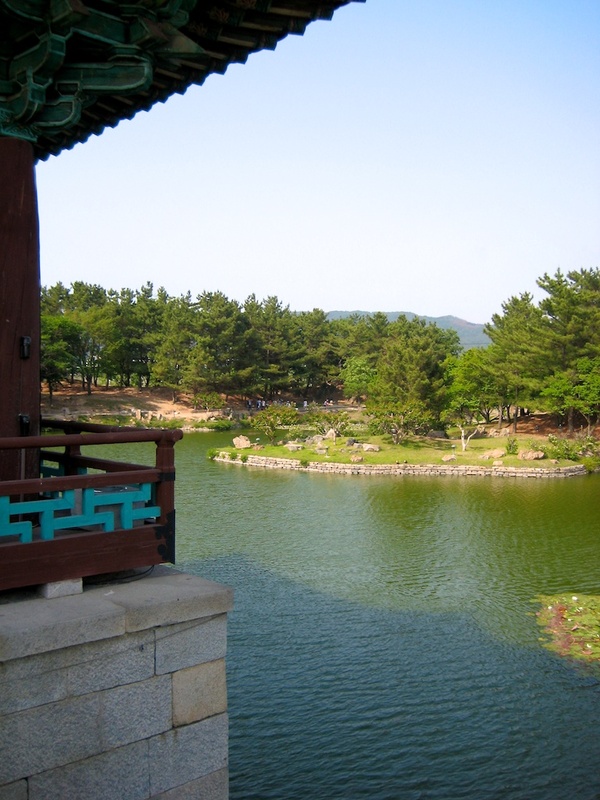 If you visit Korea, it is absolutely worth taking a couple of days to visit. 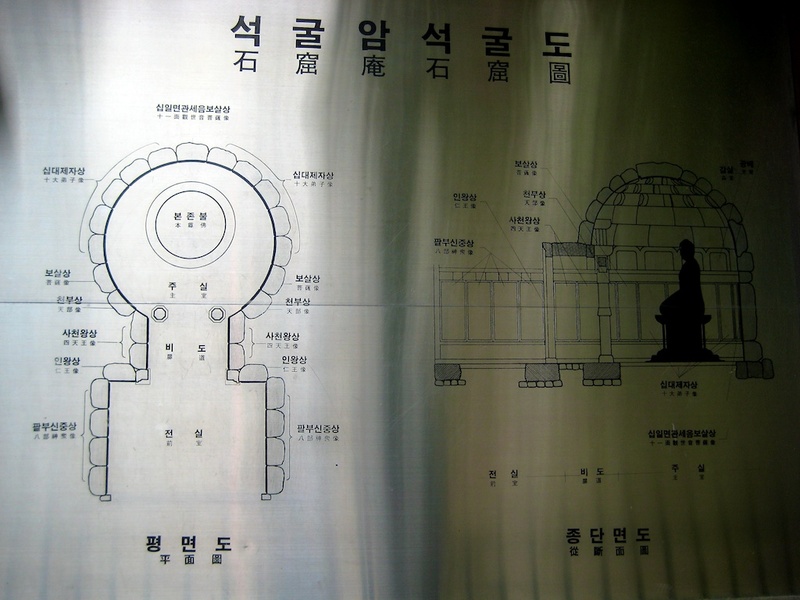 These are tombs of early Korean kings of the Shilla dynasty (57 BC to 935 AD). 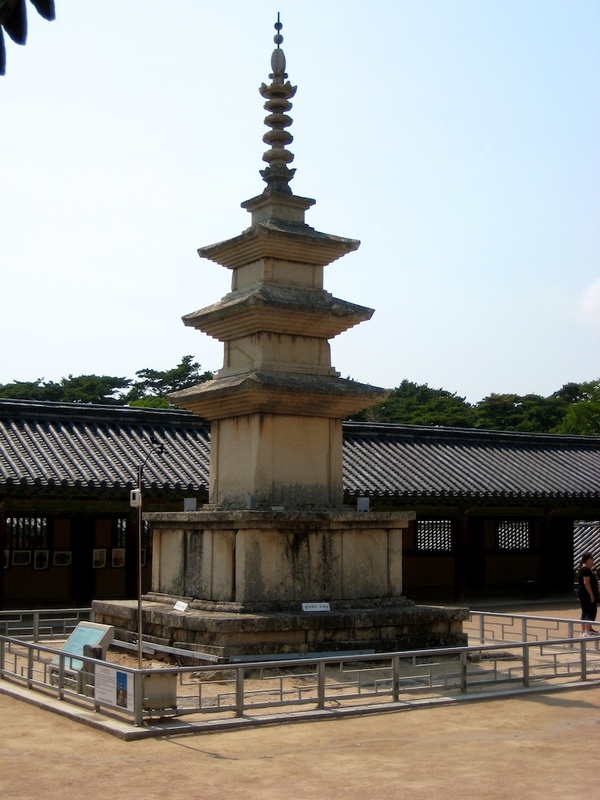 Some of them are from the Mongol rulers who invaded Korea and had a succession of 6 kings before being overthrown. The tombs were made by having a wooden chamber in the center with the king (or queen or family member, etc.) in a coffin, and often times favorite servants also buried with him to serve him in the afterlife. The chamber then had a thick layer of rock laid above it before being covered with a very large mound of dirt. The kings have the larger mounds, but there are over 20 mounds at this particular site and over 200 in the countryside around this area, varying in size as dependent on how powerful the person being buried was. The mounds were very peaceful. You wanted to climb on the top and lay on the side of the hill in the sunshine. 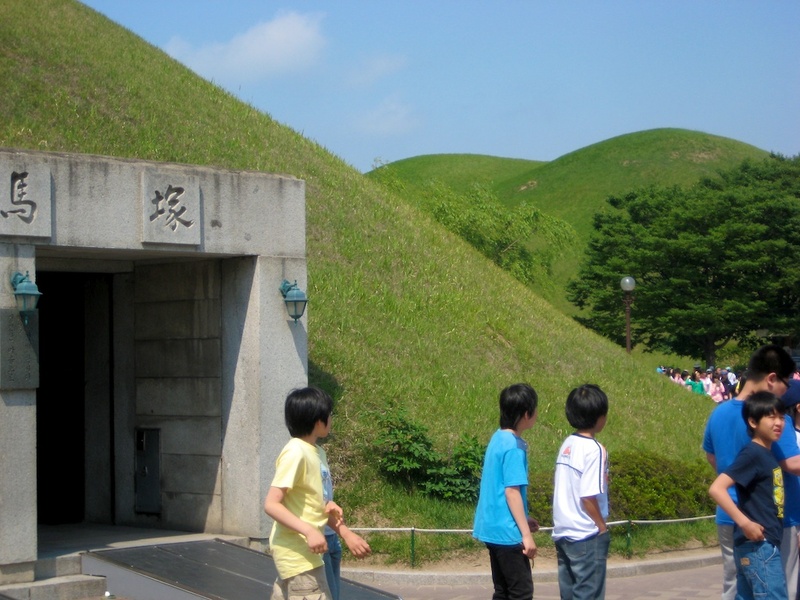 This mound was excavated under order by a previous Korean president. This decision was protested by many of the locals who felt it was robbing the grave of their ancestors. 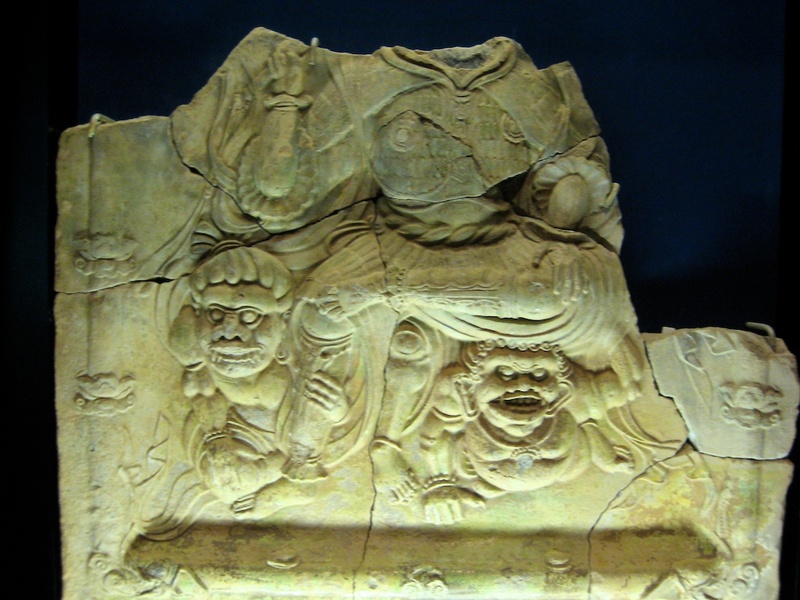 In the mound they uncovered a picture of a “heavenly horse”, a horse with wings, on the side of a saddle, so it is known as Chonmachong, “the heavenly horse” tomb. They also uncovered jewelry belonging to the king, and some bones and teeth, which were discovered to belong to a 16 year old girl, likely the king’s favorite concubine, who was buried next to the king. 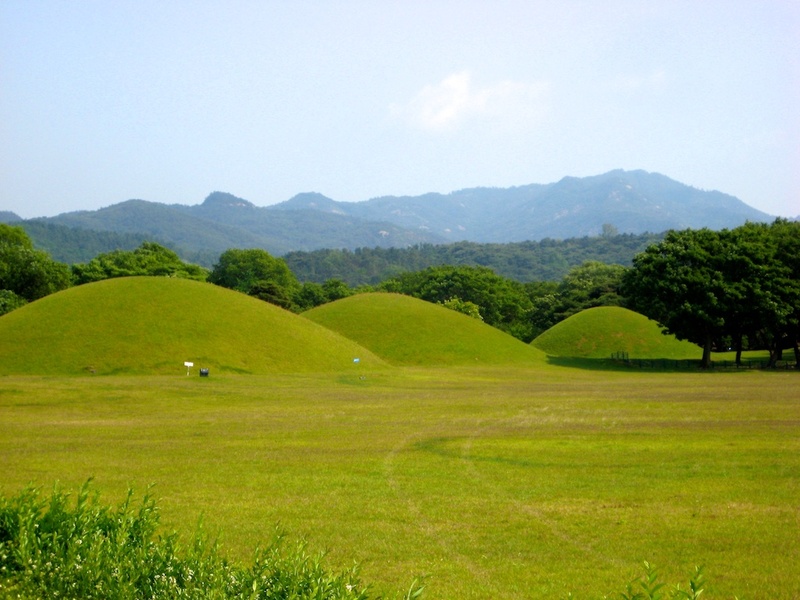 There are around 20 mounds on this site, Tumuli Park, the largest of the tomb sites in the area. 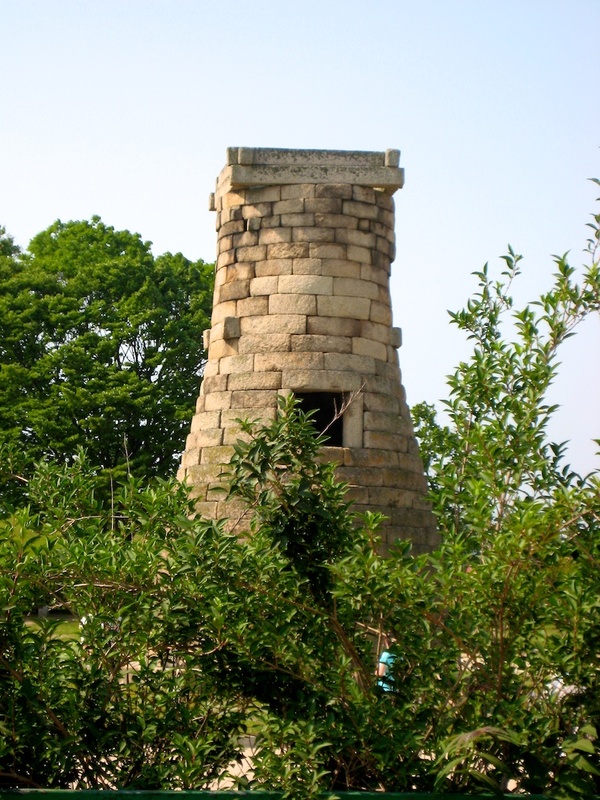 This is Chomsongdae, the oldest, still standing observatory in Asia, built in 647 as ordered by the first Korean queen (who ruled Shilla), Queen Sunduk (yes, that Queen Sunduk). It’s about 30 feet tall, and the base of it is filled in, so observers would only have entered the top part where they could look out at the sky. One of the nicest sites we visited was Anapchi Lake. 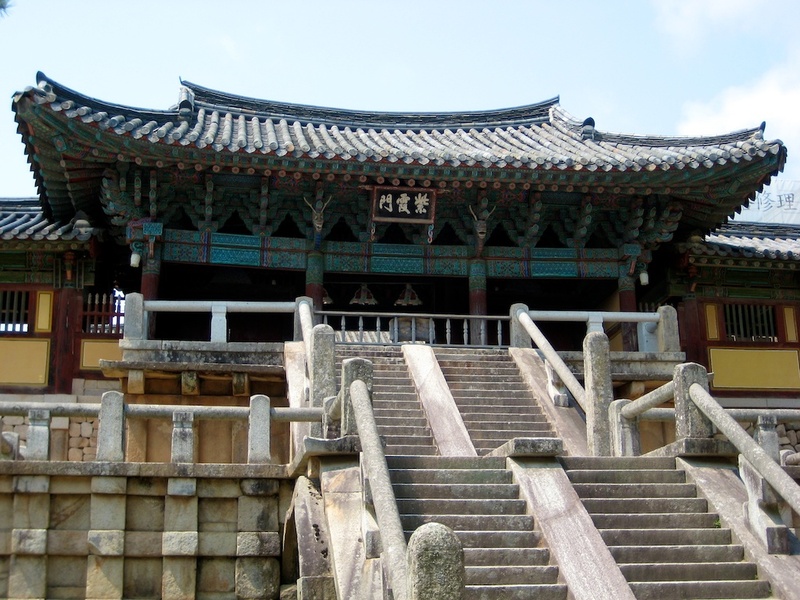 It was built upon the founding of Korea, when the three kingdoms were brought under the control of a single king. It has three islands, and the lake is meant to symbolize the ocean, as the edges of it wind so you can never see the end of the water. It was filled with wildlife, trees and flowers. 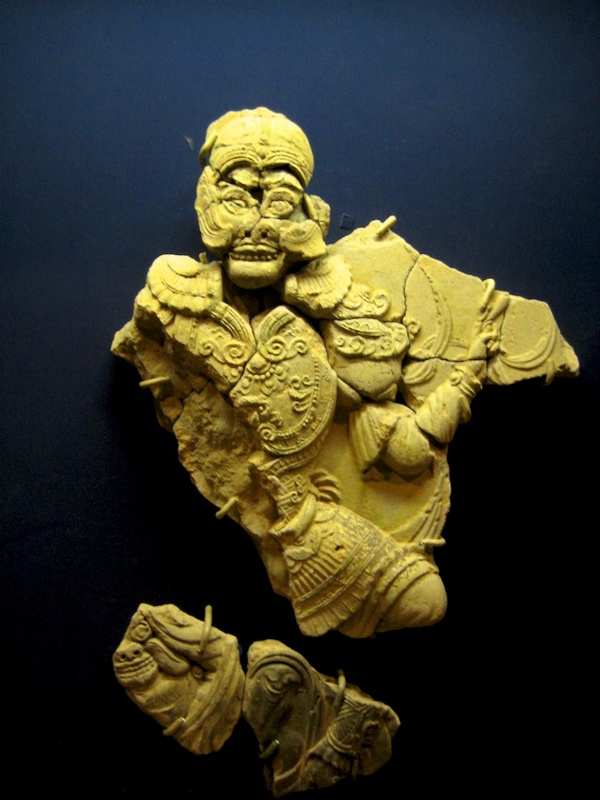 They found more than 30,000 relics at its bottom, many of them giving clues to everyday life as opposed to more commonly preserved royal artifacts found in other sites. This included a cool wooden dice used for a drinking game. It had instructions on each side, such as to take 3 drinks, or on another side to slap someone else’s nose. Pretty funny. The lake itself was gorgeous. They’ve restored two of the buildings on the site, but you can see markers for where the pillars of all the other buildings around the edge of the lake would have been. 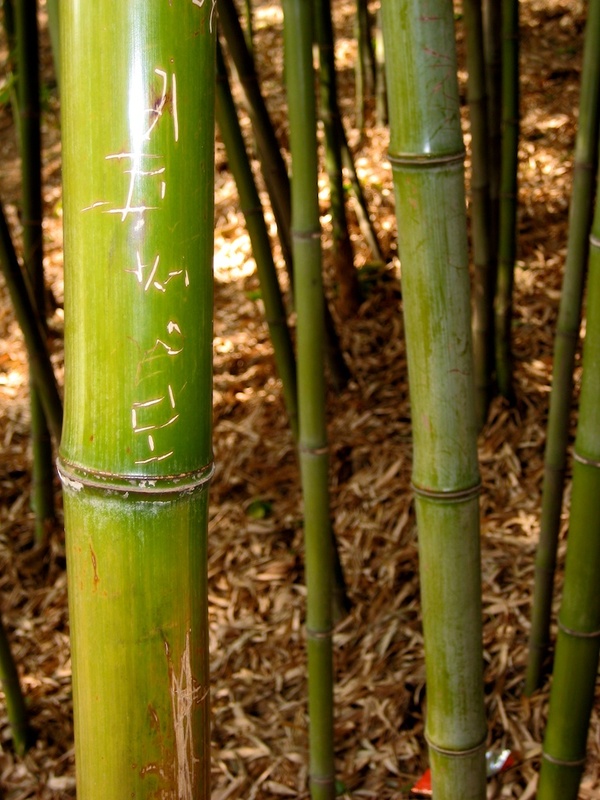 In the woods around the lake, there are areas filled with bamboo. Amongst the bamboo I found places where people had carved their names or phrases. After visiting Anapchi Lake, we went to the Gyeongju National Museum which had a wonderful collection of buddhas recovered from temple sites in the region. 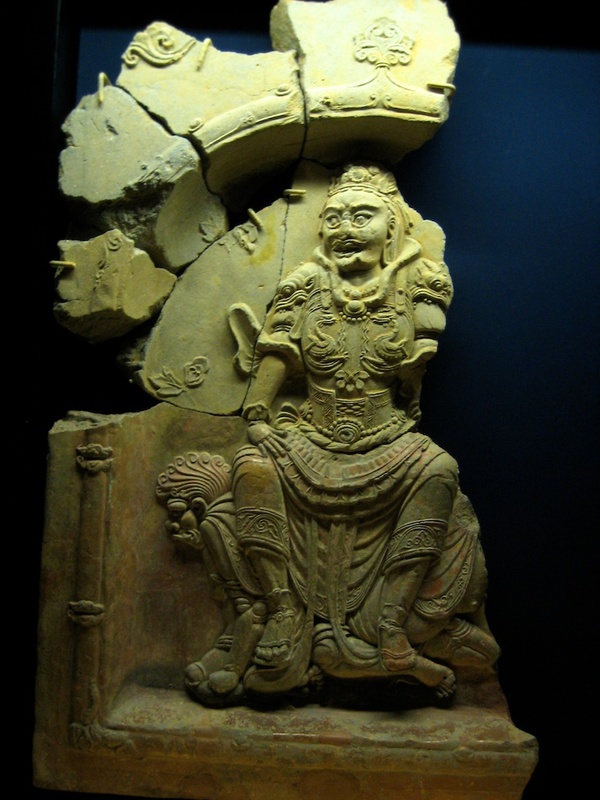 The museum had a new exhibit of some awesome temple wall sculptures which had just been unearthed in 2006. The detail was amazing. 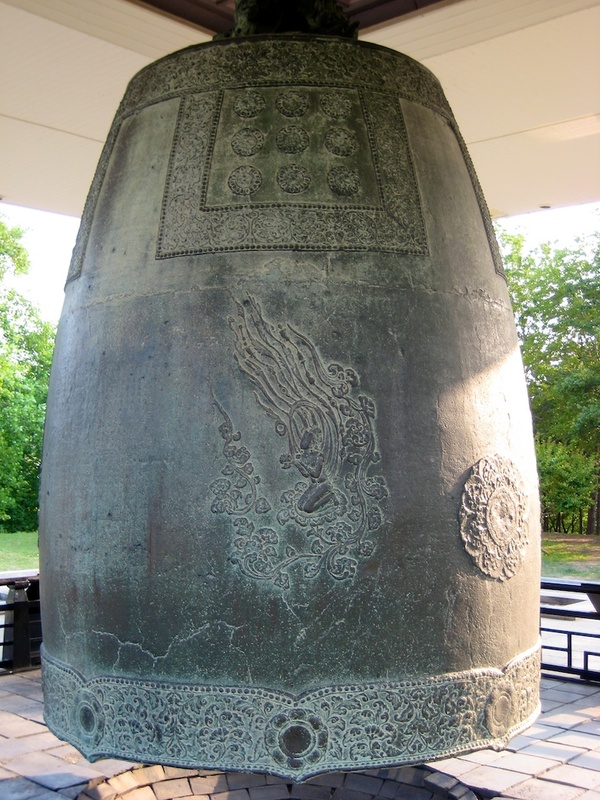 At the museum, we also saw the Divine Bell of King Songdok. It was constructed in 771, is huge, and weighs 18.9 tons. It is also called the Emile bell due to a folk tale concerning it. The legend is that upon completion of its initial construction, when it was presented to the king, it made a horrible clanging sound. The king ordered it corrected, but they could not, and it passed onto the following king. A rumor spread that a clear-hearted child had to be sacrificed for the bell to ring true. A poor woman gave her daughter to be sacrificed for the king, and she was thrown into the molten metal when the bell was reforged. The bell then rang true and gave off a beautiful, mournful tone which sounded like “Emile” which is what a little girl, crying for her mother says. We also saw some carved wooden strikers to knock against these large temple bells. You can imagine what size the bell must have been (as this is not the original bell that went with the knocker in this picture) for this size of a ringer (I’m sure there’s a better name for this thing than a bell ringer, but I have no idea what it is). We also visited a beautiful temple in the mountains. 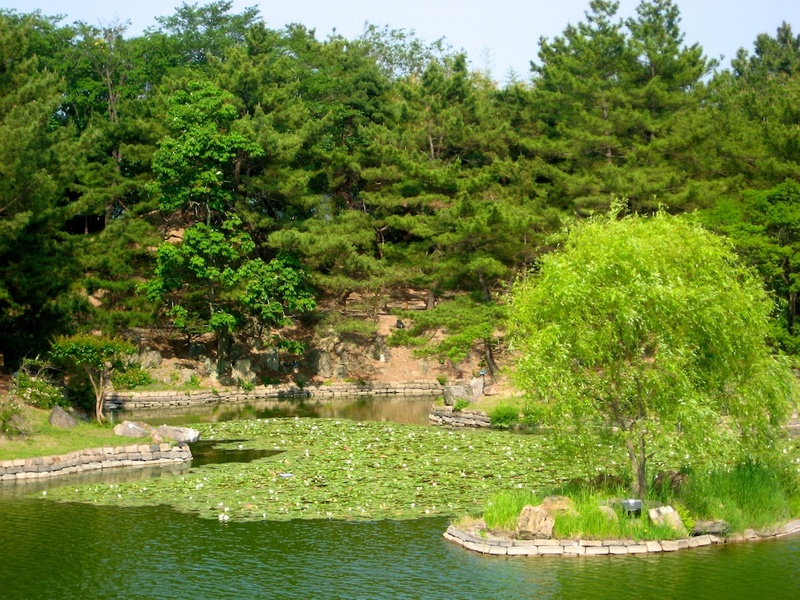 Bulguksa Temple, built by King Pophung in 528 had this beautiful pond. 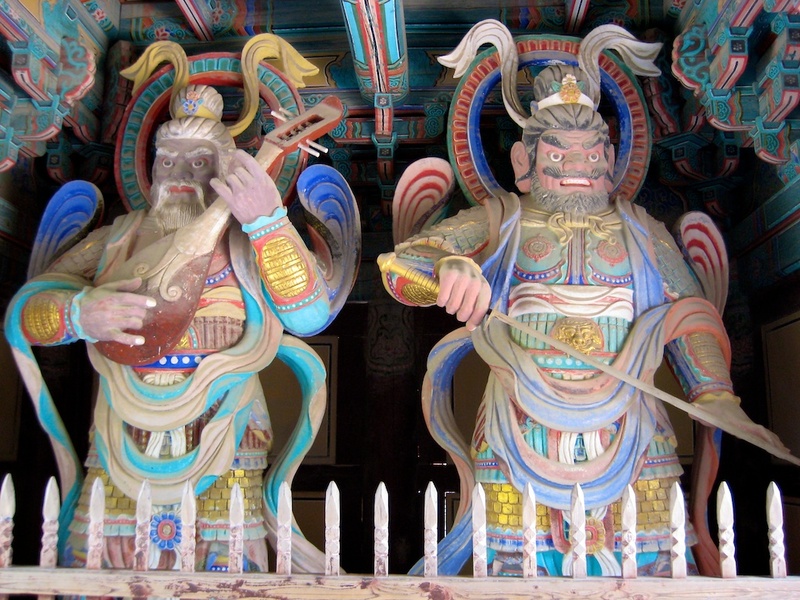 There were also these statues of the 4 Heavenly Kings inside of Chonwang Gate at the entrance to the temple. They are the guardians of the North, South, East, and West, and protect the temple. Bulguksa Temple was very beautiful. I only wish we could have seen it in the fall with all of the trees around it ablaze. Here is the large stairway leading into the temple. The stairs were intended to have you reflect as you climbed your way to the temple. This part of the temple symbolizes heaven, while other parts symbolize earth. 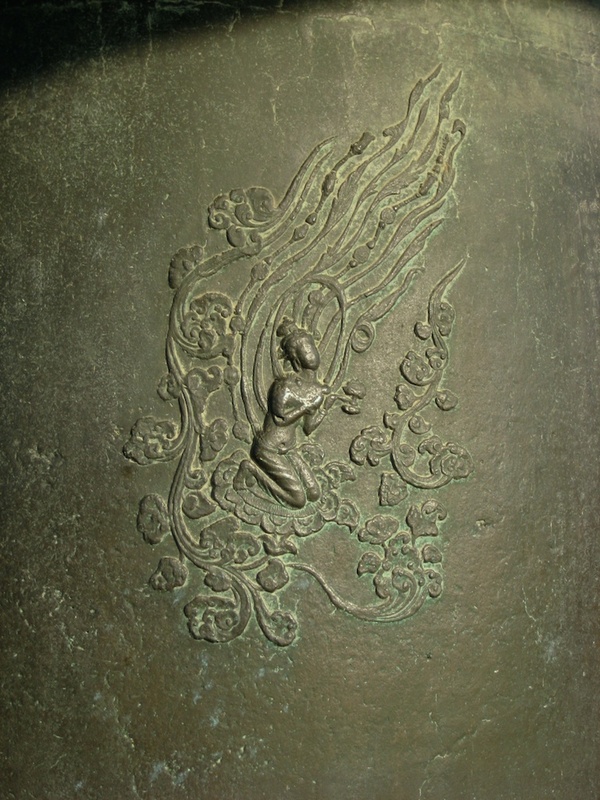 Sokkat’ap, was designated as a national treasure, a Pagoda of Buddha. These represent the body of Buddha, and often entombed actual ashes from the Buddha’s cremated body. The temple also had another cool, giant carved wooden knocker. We next took a short bus ride and then hiked up the mountain to to Seokguram Temple, another temple in the mountains, built in 751. Although it was summer and we had left hot temperatures in Seoul, this high in the mountains, we discovered that it was quite cold. I had brought nothing to wear but sandals, t-shirts, and shorts, and ended up wearing every item of clothing I had brought for the weekend in an attempt to alleviate some of the chill. It was so windy! This temple is most famous for housing an amazing sculpture of buddha. The sculpture remains in amazing condition. When the Japanese sought to restore some of the area during the colonial period, they put in a structure around the buddha. 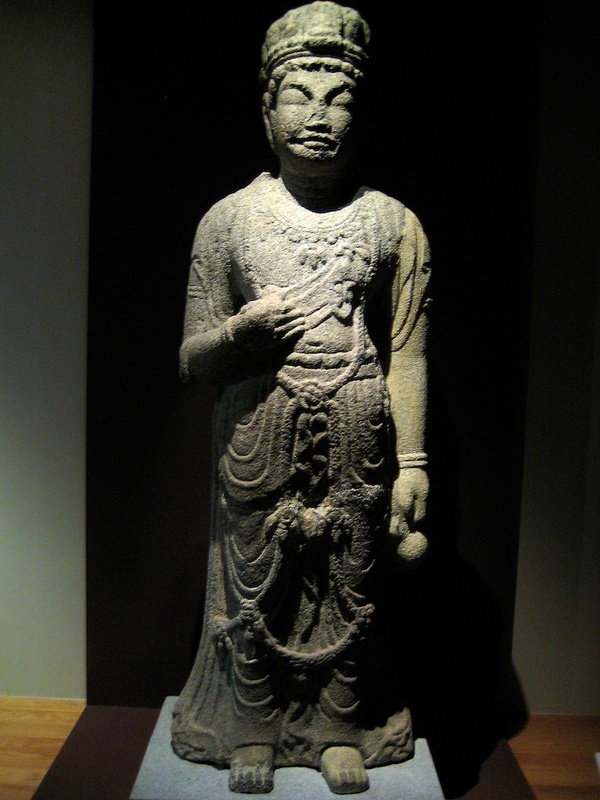 This upset the careful balance which had been established by those in the Shilla dynasty who constructed the buddha, and the concrete held excess moisture which caused the well preserved buddha to start to quickly deteriorate. 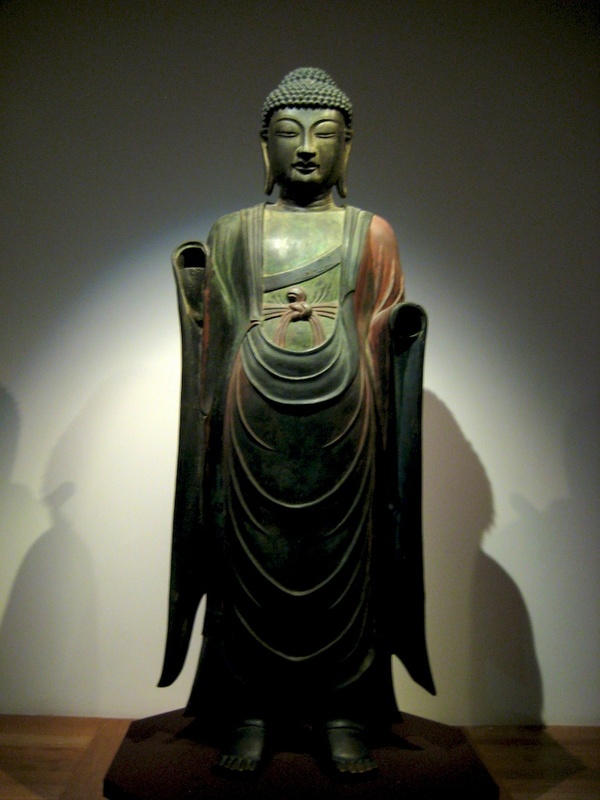 Originally, the buddha was also constructed so that sunshine would highlight his face and the halo carved on the wall behind him, which would then reflect and highlight the faces of the other buddhas surrounding him. The Japanese also walled this off as a symbol for control of Korean patriotism. The statue is now kept inside this temple behind glass to try and preserve it. They posted no photos could be taken, so this one is from Wikipedia. A very beautiful and well preserved statue. Another fun part of the trip was the bus stopped off at these huge rest stops that have probably 10-15 restaurants. People would rush off of the bus and chow down, us included. 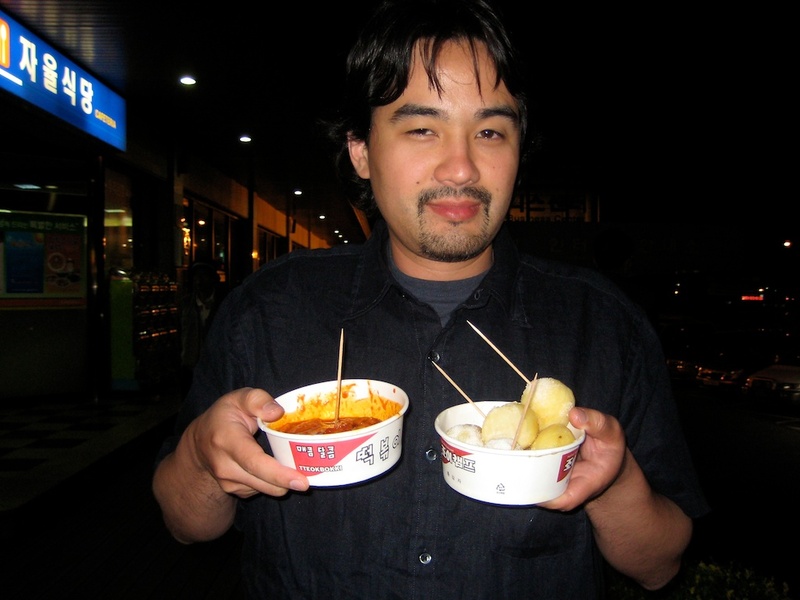 We picked up some spicy rice cake (Ddeokbokki) and these boiled and then fried baby potatoes served with sea salt. I have been accused in the past of making silly faces in front of the camera, so Sunnie told me to try to look cool for a change. What do you think, did I succeed? Seriously though, if rest stops were like this in the US, I think I’d be willing to travel more often. It really helped to break up the trip. 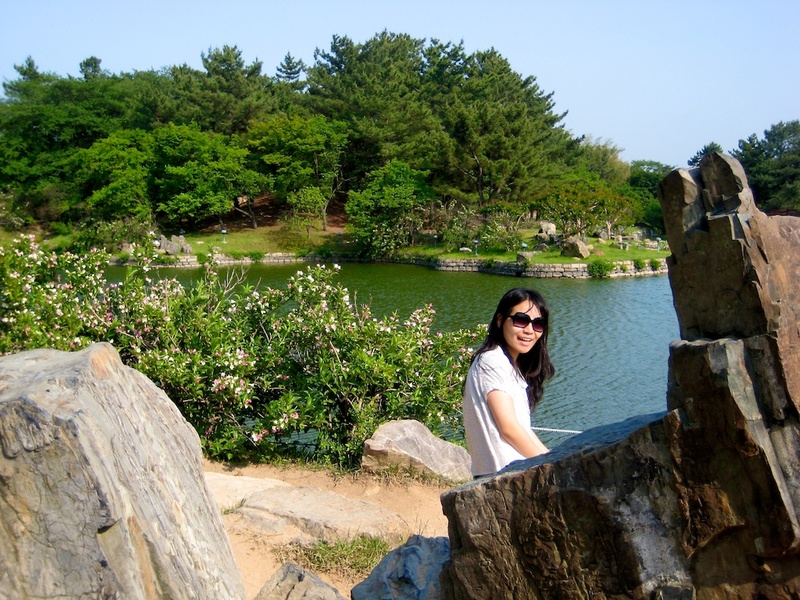 There is so much to see in Gyeongju. We were pretty rushed to see all that we could and still could have used at least another day there. The mountains, ponds, streams, and trees are all so beautiful, and history is everywhere you look. 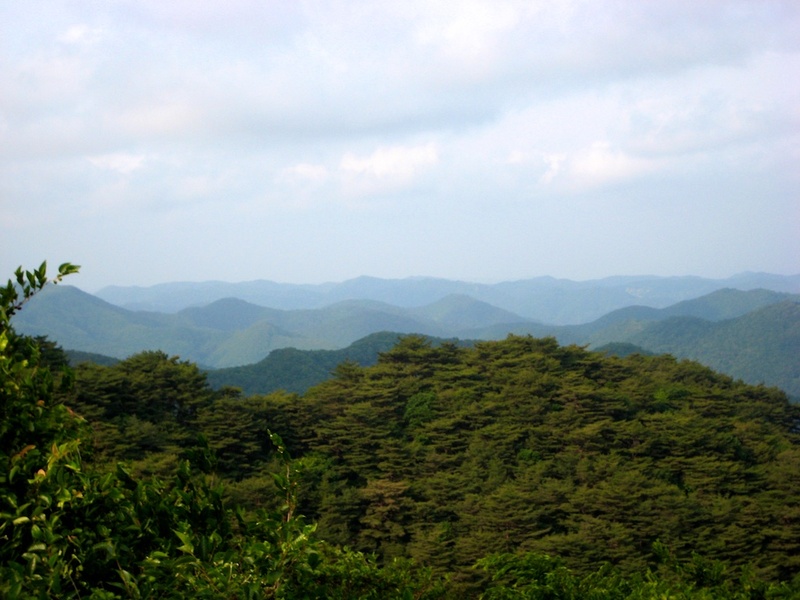 Be sure to make the trip from Seoul and give yourself several days to visit everywhere. And remember, the mountains are cold! Thanks for finding us, Stephanie, and I’m glad you enjoyed the post! Hi, Bill. Oh, lovely post! 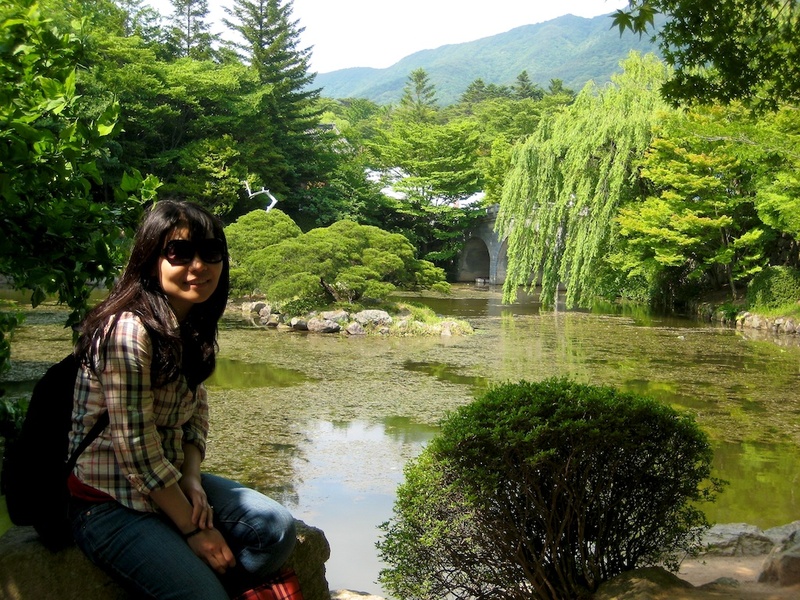 Gyeongju was fantastic for me, too. I have many of the same pictures. 🙂 The National Museum in Gyeongju is just full of treasures. I was surprised by your picture of Chomsongdae, because I don’t remember any trees being around it! 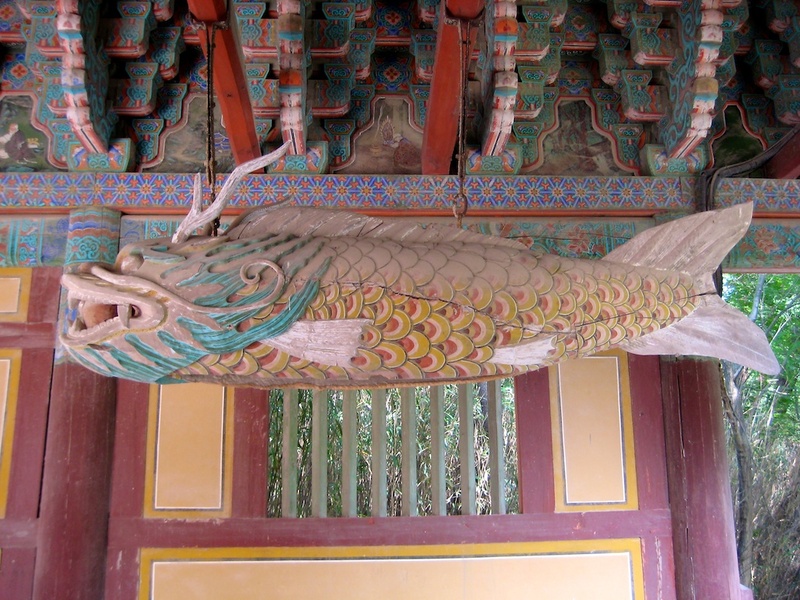 One possible correction–I don’t know about the fish next to the Great Bell, but the fish at Bulguksa is an instrument in itself. It’s one of the “four articles” that Buddhist temples have that are played to send out a call to the creatures of the earth, sky, and sea. 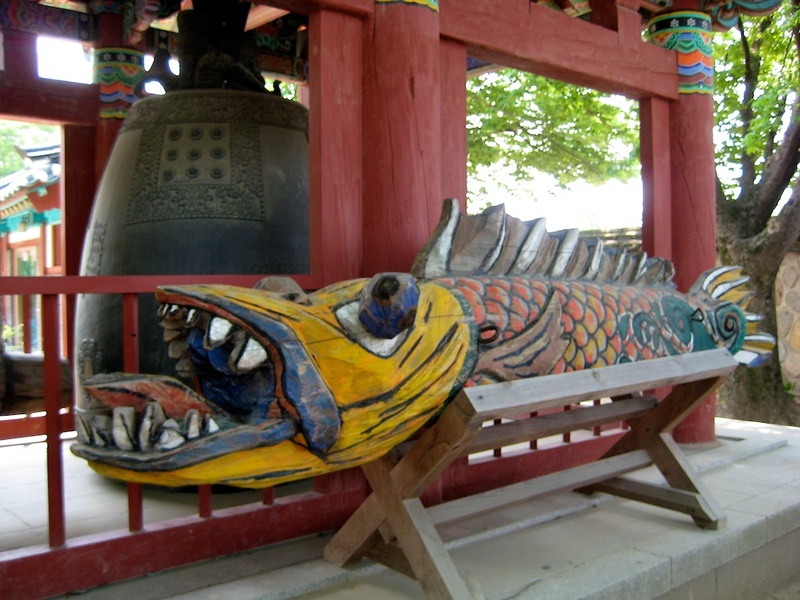 There’s the big drum, a cloud gong, a big bell, and this wooden fish gong. You can see a slit on its underside through which the wooden sticks hang that are used to make a sound with the gong. (http://english.visitkorea.or.kr/enu/CU/content/cms_view_317586.jsp?gotoPage=1) The word you were searching for to describe that piece of the metal bell is “clapper,” by the way. This post really took me back. Thank you! Hi, Lu. Yeah, there must be a word for that thing. A striker, maybe? Thanks for telling me that about the fish being a gong. I had no idea about that. Glad you were able to visit Gyeongju too. I really wish I could get there in autumn sometime and see all of the trees in color…. I just realized that you probably know what a clapper is and were looking for a word to describe the thing that knocks a bell from the OUTSIDE. Oops. Sorry, Bill!